Plunge the tomatoes into hot water, skin them, remove the seeds and chop. Chop the bacon and brown it in several spoonfuls of oil. As soon as the fat has melted, remove from the pan and kay aside. Sauté the sliced onion in the same oil. Add the tomatoes and salt and allow the sauce to thicken for about ten minutes. Replace the cooked bacon and flavour with chilli powder. 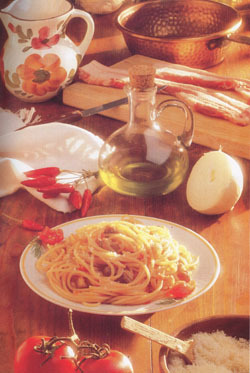 Use the sauce to flavour the bucatini, cooked in boiling salted water and drained when al dente. Sprinkle generously with grated pecorino. The original recipe used little or no tomato and it is thus possible to do without.